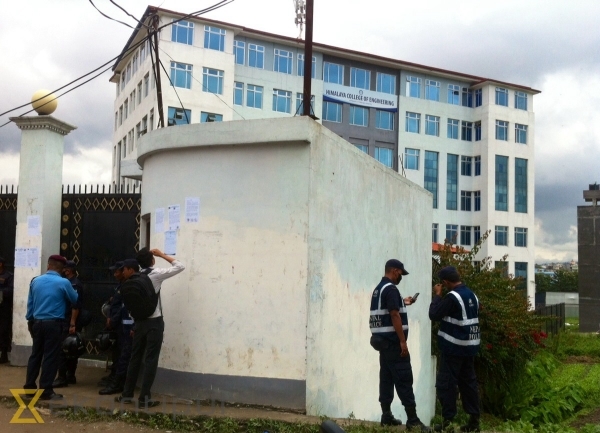 Police continue guarding the entrance of Himalaya College of Engineering. 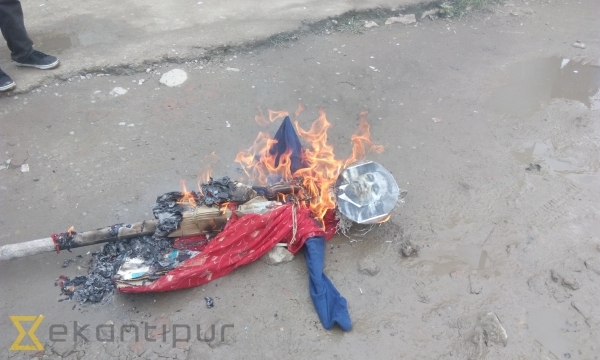 Students burn the effigy of college director Kishor Gautam. Situation remained tense at Chyasal-based Himalaya College of Engineering after police chased away protesting students on Wednesday night. The college remains closed while police have barred entrance to the students. Fourth year students of Civil engineering had staged a sit-in on campus on Wednesday to press college management to increase their research grant. According to a student, Kashi Nath Puri, college director Kishor Gautam called in police to disrupt their peaceful demonstration. Three students have been hospitalised while more than 20 have been injured as police used force under the direction of college staff Yuvraj Pandey, he said. Despite repeated attempts, college directors and principal was not available for comment.